 Following the Edgar-winning Deadly Allies: 11 pairs of stories on variously related themes (felonious spouses, con artists, the performing arts, etc. 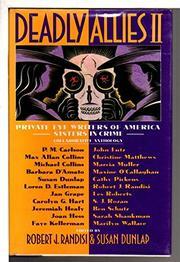 ), half by members of the Private Eye Writers of America, half by Sisters in Crime. The product is a decidedly mixed bag. If the stories were all as good as the best of the bunch--S.J. Rozan's ``Film at Eleven'' and Benjamin Schultz's ``What Goes Around,'' professional tales of sting and countersting; Joan Hess' caustic ``Paper Trail,'' chronicling the gentle cross-plotting of a famous writer and her slavey; and ``Gentle Insanities,'' newcomer Christine Matthews' peek at a p.i. 's agonized private life--the anthology would be the bargain of the year. But most of the other big- name tenants--Marcia Muller, Jeremiah Healy, John Lutz, Max Allan Collins, Faye Kellerman, Loren D. Estleman, Marilyn Wallace, and both editors--have done better work elsewhere. Still: a generous double-helping from just the authors you'd want to have, even if they're holding less than a full house.